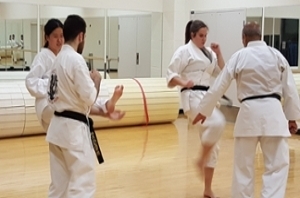 The UWO Karate Club promotes the practice of Shorin Ryu Karate. The Shorin Ryu style of Karate is a traditional martial art that was developed on the island of Okinawa (today part of Japan). 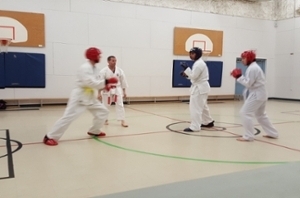 Our training sessions emphasize physical conditioning and practicing kicks, strikes, blocks, as well as kata. You will also spar with partners, learn various techniques for self-defence, and train with traditional Okinawan weapons. The Karate Club offers a friendly, helpful, and safe environment to practice Karate under the guidance of highly experienced instructors. The club welcomes undergraduates and grad students alike, whether you are a beginner or an experienced Karateka. Please contact us at any time during the year or attend one of our practices (uniforms not required). This year Karate Club has two presidents: Yusra Irfan and Samantha Gorun. Hey! My name is Yusra Irfan, I am a third-year engineering student specializing in software engineering . To tell you a little bit about myself, I started karate when I was in Grade 1 but unfortunately stopped in Grade 6. Since coming to Western, I have restarted my journey to achieve the almighty BLACK BELT!  After a year of attending The Western Karate Club 屢, it has become a passion of mine. Not only does the club help me relieve stress but has also helped me make friends and stay active. Outside of Karate, I am a couch bug and like to play board games and watch TV. I hope this year will be awesome, and we will all try to reach the almighty BLACK BELT! TOGETHER! Hello everyone! My name is Samantha Gorun and I am in my 2nd year of my MSc in Biostatistics. I joined the UWO Karate Club during my first year as I had always wanted to learn a martial art. I quickly fell in love with the sport and the people. Aside from attending Karate Club, I love to meet new people, try new things, and bake. I know that the 2019-2020 year will be amazing for Karate Club. I look forward to seeing you. Weapons Seminar: Every year we invite an eighth-dan black belt to come in an teach a two hour weapons seminar, teaching students the basics of the weapon, a short kata, and self-defense (both using and defending against the weapon). Weapons taught in the past include: bo, tambo, and kama. 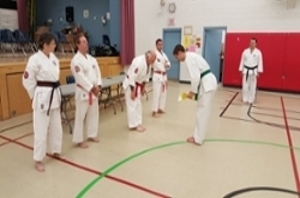 Christmas Banquet : Each year, Legacy Shorin-Ryu dojos from London, Windsor, Sarnia, and the surrounding areas come together to recognize the achievements of members and to socialize between clubs. A buffet dinner is provided while guests chat amongst themselves and awards and black belt presentations are made. Club Socials: At the end of each semester, the UWO Karate Club gathers all members and instructors for a social event to celebrate achievements of the past year and to allow members to get to know each other outside of the club. Past events have included: Grad Club Dinners, Movie Nights, Knife Throwing, and Bowling. Sport Club practices for Fall 2018 begin on Sunday Sept 23 and will conclude on Saturday Dec 1 2018. Thursdays - 6:00-7:30pm (WSRC Studio #2). In addition, we offer an optional open classes on Sundays (2:30-4pm in WSRC Studio #2).